The Amish have made their home in Ohio since 1808, when the first settlers moved west from Somerset County in Pennsylvania to settle the hills and valleys of eastern Ohio. Today, Amish number nearly 60,000 in Ohio, spread across 52 individual settlements and over 400 church districts (Young Center, 2010). 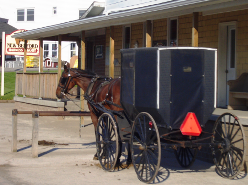 Holmes County is noteworthy among Amish settlements in Ohio in that it is home to a very diverse group of Amish. Holmes County differs from other large settlements such as Lancaster County, Pennsylvania, and Lagrange and Elkhart Counties in Indiana. Both of those settlements consist of a single Amish affiliation, while Holmes County at present is comprised of 11 distinct affiliations. These range from the progressive New Order Amish, with around 20 church districts, to the numerically largest affiliation, the Old Order, to the somewhat more conservative Andy Weaver or ‘Dan Church’ Amish, and finally the Swartzentruber Amish, a very tradition-minded group resistant to technological change. Amish mainly live in the eastern half of Holmes County, and comprise about half of the county’s population of 40,000. The total population of this settlement is around 30,000 individuals, when taking into account Amish living in adjacent counties. Significant numbers of Amish are found in Wayne County, as well as in neighboring Tuscarawas County (near the towns of Sugarcreek and Baltic), as well as in Coshocton County to the south. Holmes County is known for its hilly terrain, which gradually becomes flatter as one approaches Wayne County to the north. To the west, Amish from the settlement have formed church districts geographically distant from the main body of the settlement, at towns such as Nashville and Loudonville. Berlin is the small tourist-focused town at the heart of the Holmes County community. Mount Hope is another town notable for its auction house and proximity to numerous Amish-owned furniture shops. Other towns in the community include Winesburg, Charm, Farmerstown, and Becks Mills, as well as Millersburg, the county seat. Holmes County is notable for the Holmes County Trail, a renovated railbed which has been converted into a recreational trail extending into Wayne County. 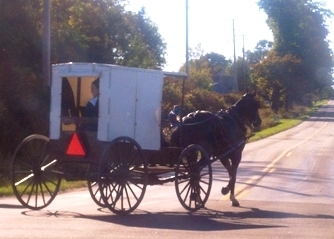 Amish frequently use the trail for travel. One half is designed to accommodate the horse-and-buggy. Amish in Holmes County work in a variety of occupations. Farming has long been in decline in the face of growing populations and scarce land. A minority remains in dairy farming, with some Amish raising produce. Small business is popular among Amish in this settlement, with many Amish furniture shops, manufacturers, and homebuilders operating out of the settlement (read more on Amish furniture in Ohio). The tourist industry, though not on par with that seen in Lancaster County, is also significant in Holmes County, and is largely centered around the towns of Berlin, Walnut Creek, and Sugar Creek. Holmes County is also notable for having a high percentage of Amish children which attend public schools. While still a minority compared to those in private schools, many more parents elect to send their children to local public schools than do so in the similarly-sized community at Lancaster County. The Swartzentruber Amish are one of the most conservative Amish groups. They originated in 1913 as the result of a division in Holmes County, and it is here that they have their largest population today. Swartzentruber buggies are easily discerned by their lack of orange slow-moving vehicle triangles. Swartzentruber Amish resist change and have only slowly adopted modern conveniences. The presence of an outhouse, lack of indoor plumbing, and dirt lanes are all signs of a Swartzentruber home, and reflect the group’s emphasis on plainness and tradition. Swartzentruber Amish have also stayed on the land to a greater degree than their more progressive cousins in Holmes County, opting less often for the home enterprises that have become popular throughout the settlement as a way of making a living. Swartzentruber Amish number around 20 church districts in this community. Another sizeable Swartzentruber settlement is found a short distance away in Ashland and Medina Counties (see “Conservative communities in Ohio” below). Read more on the customs and origins of the Swartzentruber Amish. New Order Amish, comprising only a small percentage of all Amish, find their largest grouping here in Holmes County. The New Order group is distinguished from other Amish affiliations in that most New Order churches hold Sunday Schools on alternate Sundays. Additionally, one could say they have a more “outward-looking” approach to Christianity. While, like other Amish, they do not actively proselytize, they have exhibited their relative openness to outreach by printing tracts and pamphlets outlining their beliefs. Interestingly, New Order Amish tend to be generally more progressive when it comes to technology, but are quite conservative when it comes to use and cultivation of tobacco, as well as youth courting standards, creating a dichotomy that prevents easy labeling. The New Order Amish came about in the 1960’s, and have since spawned a few other groups, including the “New” New Order, which allows a greater degree of technology and electricity. Read more on the New Order Amish. The Old Order Amish in Holmes County are the largest affiliation, comprising approximately 130 church districts. Old Order Amish live next door to their neighbors of other affiliations. Old Order Amish do not exchange ministers with Amish of other affiliations, but cooperate with other Amish churches on numerous levels, including in such matters as business, road safety, and schooling. Unlike in the Lancaster County community, a significant percentage of Holmes County Old Order Amish send their children to the local public schools, which in turn have often adapted to accommodate Amish practices. The Andy Weaver Amish affiliation emerged in 1952 over disagreements concerning the application of social shunning. The name “Andy Weaver” comes from an early leader, and the commonly-used nickname “Dan” church comes from the fact that at one time, a number of leaders in one church all bore that name. Andy Weaver Amish are known to be technologically conservative, and also stricter on church matters than the Old Order Amish. Andy Weaver Amish hold to a strict interpretation of the doctrine of social shunning, which sets them apart from the Old and New Order affiliations. Andy Weaver Amish are more liberal regarding tobacco and alcohol use, but also have stricter youth standards, such as a prohibition on ownership of cars while living at home. Andy Weaver Amish number about 30 congregations in Holmes County, and have daughter settlements in other communities, including in New York. Read more on the Andy Weaver Amish. Not too far to the north of Holmes County lies the Geauga County settlement. The Geauga County community is the second-largest Amish settlement in Ohio and fourth-largest in North America, with 88 church districts and a population over 12,000 as of 2010 (Young Center). The Geauga County settlement was founded by Amish from Holmes County, who trekked north in search of farmland. Amish from Holmes County first settled here in 1886. Like Amish in other settlements, Geauga County Amish make a living running small businesses, farming, and doing manual labor. Factory work is quite common here as well, more so than in many other communities. Among the businesses are furniture and machine shops, stores, and construction companies. Some Geauga Amish also supplement their income selling maple syrup, tapping into the extensive maple forests in the area. A tourist industry exists, though it is somewhat less-developed than that of other large settlements. The Geauga settlement is centered around the town of Middlefield, and today stretches into both Trumbull and Ashtabula Counties. Geauga County originated with settlers from nearby Holmes County, but today ties between the two communities are not as strong as one might suppose, given their close proximity and common roots. Geauga County is home to a number of more conservative church districts, locally referred to as the “number two’s”. Geauga County has developed a reputation for wild youth behavior, an image which has not been helped by newspaper publications about Amish youth misbehavior. 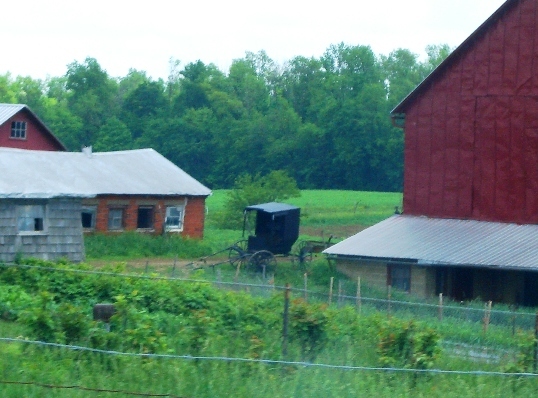 The Geauga County settlement is in some ways overshadowed by the Holmes County settlement to the south, but nonetheless is a significant center of population of Amish in Ohio. In addition to the large Swartzentruber presence in Holmes County, Ashland and Medina Counties (1952) are home to a collection of conservative Amish churches. With 14 settlements, it is the third largest Amish settlement in the state. 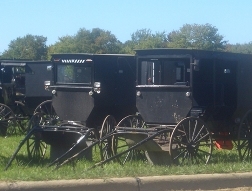 Amish here are of Swartzentruber affiliations, and represent all three sub-groups within the Swartzentruber family. This group is commonly referred to as the Lodi Amish, after a nearby town. One finds numerous small businesses in Ashland and Medina counties, most of them oriented to the low level of technology permitted by the Swartzentruber affiliation. These may include greenhouses, small-scale furniture makers, food producers, as well as shops that cater to the Amish, including harness shops. 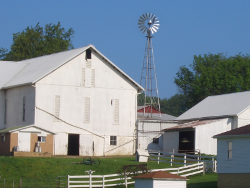 Amish here also maintain a strong farming tradition, with both dairy farming and produce farming common. Read more on the Ashland and Medina County Amish. Ohio is also the only state besides Pennsylvania with a population of Nebraska Amish, located in the eastern part of the state near the town of Andover (1992), and numbering just a single district. The white-topped buggies of the highly conservative Nebraska group mark them as distinct from others in the state. Read more about Nebraska Amish. Sizeable Amish populations are also found in other locations around the state. Ashland and Richland counties are home to a community of 7 church districts (1954), notable for their use of gray Slow Moving Vehicle triangles, outlining a smaller orange triangle in the center. Amish near Kenton in Hardin County (8 districts, 1953) also employ gray rather than orange reflective material. Knox County, near Fredericktown and Bellville is home to a community numbering 8 church districts (1972). Two of the oldest, yet also among the smallest Ohio Amish settlements are found at Hicksville (1914) near the Indiana border, and at Plain City (1896) in Madison County. Each founded around 100 years ago, today these two settlements are barely holding on to existence, with a single church district each. The long-lived Amish settlement at Hartville in Stark County recently went extinct after more than a century in existence (1905-2007). Numerous other communities exist across the state. Many of them have been started in recent years, with at least 15 new Ohio settlements having been founded since 2000. Most new settlements number just one or two districts. In addition to Amish, Ohio is home to a substantial Old Order Mennonite population at Shiloh in the north-central part of the state. This group originated in Lancaster County and has lived in the area for a number of years, farming and operating small businesses. One Old Order Mennonite family operates a large variety store featuring fabrics, pottery, and a number of other items, and housed in a large converted barn. In total, Ohio is home to nearly 60,000 Amish spread among 430+ church districts. Ohio has the second largest number of actual settlements, with 52 as of 2010. Ohio’s Amish population has grown to become one of the largest, and most diverse, since the first Amish settled here in the early 1800s.